Sweden based developer Image & Form has teased a spiritual sequel to its indie fan-favorite SteamWorld Dig. 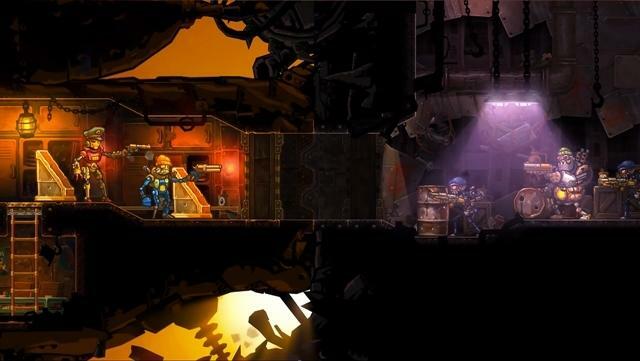 SteamWorld Heist, seen in the teaser trailer, retains the same excellent steampunk art style which made the first game look so good, but the gameplay couldn't be more different. The first game was an excellent spin on the "metroidvania" sub-genre of action platformers with the addition of mining minerals for upgrades and powers, but this new game is a side-scrolling turn-based based strategy game. CEO Brjann Sigurgeirsson explains how the two games are related in an interview with Nintendo of Europe. "Heist isn't a sequel to SteamWorld Dig. It's set in the same world and the cowbots are still the heroes. But a lot has happened to SteamWorld since then, and we want to make a game that is radically different. Partly because we really wanted to make a turn-based strategy game, but also because it felt like a clever move. The obvious follow-up would've been Dig 2; we wanted to surprise instead. Partly because we really wanted to make a turn-based strategy game, but also because it felt like a clever move. The obvious follow-up would've been Dig 2; we wanted to surprise instead." Lead Designer Olle Håkansson also chimed in to explain that the game is different from other strategy games because it has a free-aiming system, not found in other games in the genre. "One of the key features of the game is the free aiming system. As far as I know, there are no other turn-based strategy games that do this. You have to aim really carefully before you fire, but you can also bounce shots off the walls, so that's a really good way of getting those enemies in cover." SteamWorld Heist will follow its predecessor by being released for multiple consoles next spring. Only the Nintendo 3DS version has been officially confirmed, which is probably where I'll be picking it up, but it will also most likely appear on the Wii U, PC, PlayStation 4, and PS Vita. In the meantime, be sure to check out SteamWorld Dig. It's one of my favorite indie games from the last few years, and there are plenty of platforms to play it on.